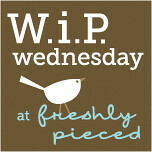 It has been quite a while since I've contributed to Lee's link-up for WIP Wednesday, but I finally feel that I am back on track with work and other endeavors. Came to fruition from a sketch in my sketchbook, with a kick in the pants from PMQG (indirectly). This was in response to the call for submissions for our guild's special exhibition at Sisters Outdoor Quilt Show this summer, and I am pleased to share that this was also among the quilts selected to be a part of that! Thank you to the lovely judges (Michelle, Gail, Ale and I believe Heather too)!! I did finally start quilting this guy this week, and am optimistic that it will go relatively quickly. of course I especially need to make a dent in this since I used up almost all of my basting pins and will need them to quilt Lock 'n' Bolt next! I have the top 1/3 of the quilt pieced.